CHAPPAQUA, NY—Saying it would provide a candid account of her experiences writing an unsuccessful tell-all, sources confirmed Thursday that Hillary Clinton is already working on a follow-up book casting blame for the failures of her previous memoir What Happened. 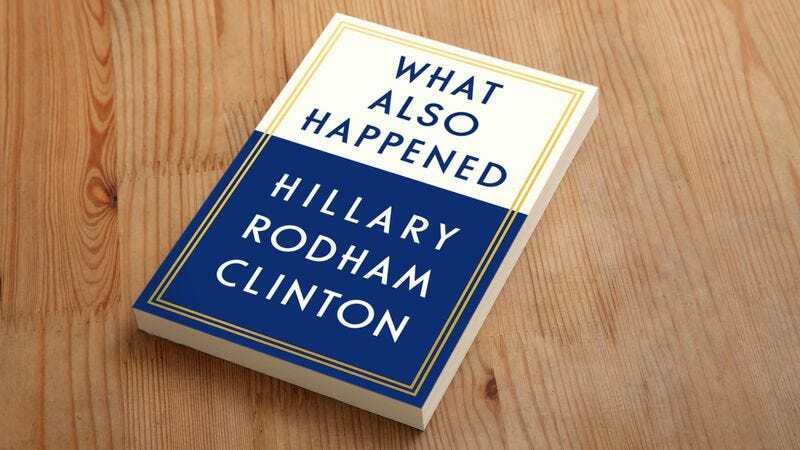 “From my agent negotiating that underwhelming deal with Simon & Schuster, to the graphic designer’s lackluster cover art, to my so-called supporters who couldn’t be bothered to drop $17.99 for the hardcover copy—everyone had a hand in undermining my last book’s success,” reads a passage from the introduction to Clinton’s What Also Happened, which repeatedly decries her prior book’s “indecipherable” font and dedicates an entire chapter to lashing out at her copy editor for making her look like “an idiot third-grader.” “I’ll never forget how Amazon buried me and how Barnes & Noble completely sabotaged me by displaying my book way in the back in that no man’s land by the CDs. Frankly, it’s obvious I got screwed on all sides.” Accusing them of stealing her spotlight, the book reportedly concludes with a long list of every other celebrity who published a memoir in the past year.